Homeowners always want the best for their homes. However, that would involve a huge investment if you would have to choose the most attractive and functional floor materials. Not everyone can afford or are willing to invest in high-end residential floors. Aside from the expenses involved in purchasing them and having them installed, cleaning and maintaining such floors will also be costly and time-consuming. If you want to improve concrete residential flooring without having to involve carpets, wood, or other high-end material in the equation, then decorative concrete is an ideal option. Decorative concrete is a method of enhancing and improving concrete floors and surfaces. Coatings and overlays can substitute pricey materials at a fraction of the cost. Although affordable, it does not compromise the much-needed features that homeowners deserve to enjoy and benefit from. It will be cool and fun to be able to choose a specific color or pattern to match the existing surroundings. There is a wide range of options to choose from, both for indoor and outdoor use. One of the best benefits that resurfaced or refinished floors can provide is value. Appealing and functional floors increase property resale value significantly. Decorative coatings and overlays provide great benefits but at a comfortable price. Of course, certain factors will influence total costs but these will be less expensive and tedious than other traditional materials. 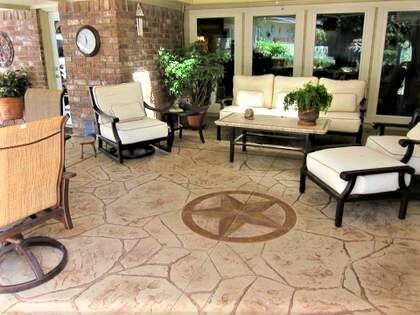 Concrete Patios – A patio will benefit from a stamped overlay, spray texture, or stain. These provide the appropriate features needed to create a stunning yet safe outdoor surface. Concrete Pool Decks – A stamped overlay and spray texture can improve the aesthetics and slip-resistance of a pool deck. A spray texture can maintain a cool temperature, making it an ideal surface for barefoot walking. Concrete Driveways – Forget about asphalt driveways. Stamped overlay and spray knockdown finish offer concrete driveway designs Indianapolis, IN which can enhance traction, appearance, and durability against weather elements and vehicular traffic. Garage Floors – These are probably the most abused floors in the house. Residential epoxy flooring and polyurea polyaspartic coatings are highly damage-resistant and impressively appealing. Transform your home into a heavenly abode. Call (317) 854-4529 for decorative concrete options. We at Indianapolis Concrete Artisans want nothing more than to enhance the quality of life of our residential customers. We have been in this industry for over 20+ years, specializing in resurfacing, refinishing, and repairing concrete surfaces, both indoors and out. Call or email us today. One of our staff will meet with you to discuss your desires in more detail.